Why Should You Hire a Roofer for Your Flat Roof? Maintaining the appearance and quality of a flat roof requires regular maintenance. By investing in this, you can ensure that your roof stays safe and can withstand harsh environments and weather conditions. Your roof will naturally age with time, but with regular maintenance and repairs, it will be guaranteed to last longer which protects your investment. There are a few key problems you will face with your flat roof, and hiring a roofer ensures these can be taken care of efficiently. Flat roofing is susceptible to ponding. This is when water from rain or melted snow pools in areas of the roof. If this ponding is not corrected right away, it can weaken the roof materials causing leaks and structural problems. Once the exterior is compromised, you may also experience internal structural damage which can be expensive, so you need to contact a roofer as soon as you notice the ponding. Over time, roofing systems can crack along the membrane. Lengthy cracks will appear spongy and are caused after periods of alternating freezing and thawing. An experienced roofer can inspect your roof after each season to identify any cracks or splits and repair them before they spread. Flat roofing typically is layers of substrate and felt, and air can become trapped within these layers. When this happens, the roof can blister which makes it unstable. You can identify blisters as elevated pockets in your roof surface. Call a roofer as soon as you see this and they can remedy the situation and prevent further and more expensive damage. Ridges can also occur when a bituminous buildup occurs within the joints of the roof insulation. This typically happens when moisture condenses under the felt layers. Ridges appear as long, narrow crevices and they most likely can be seen along membranes that are not securely attached. 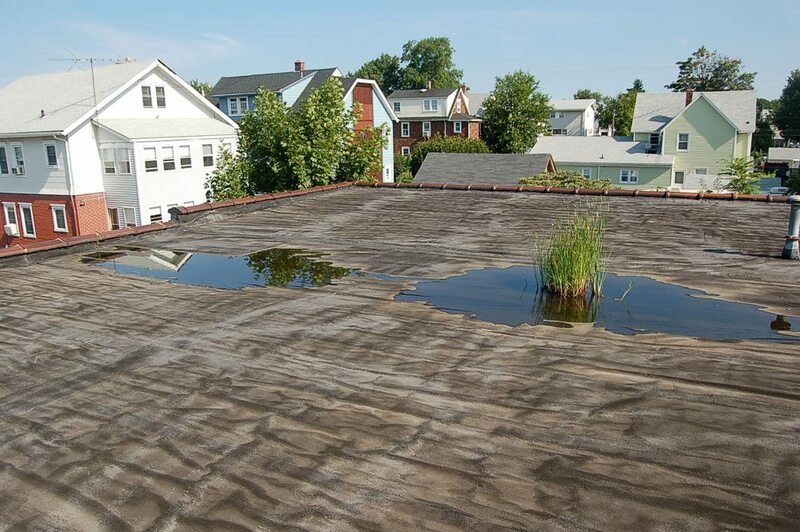 These issues are common with flat roofing systems, but with regular inspections and maintenance, they can be avoided or repaired once identified. We recommend that you call us to inspect your roof even if you have not noticed any of these problems. With a regular check, we can prevent these problems from occurring before they cause too much damage. Preventative maintenance will be the best way to protect your roof, your building, and your investment.